From High In The Sky: Memorandum Monday: Let's Have a Yarn.. Memorandum Monday: Let's Have a Yarn..
Monday! Hello there! In this house you are marking the first full week of freedom - no exams left now. For the rest of us, it's business as usual. But with added teenager. I'm not complaining! I'm going to make the best of having her around over the summer, before we are down to a twosome for the first time in..many, many years. They find it hard to believe, our pair, when they ask what we'll do after they're gone, and I reply that their father and I were together for ten years before they came along. I think we'll be just fine. We had a little rehearsal this weekend, while Guide Camp was in progress. We "dined in for two" thanks to Marks & Spencer and we took a trip - the kind teenagers don't volunteer for - to a beautiful village outside of town. What did I do for the first time here? I finally made it to the wool shop. And already I'm looking forward to going back. You can see why: look at the colours! I tried not to touch too much, I couldn't help myself, I chose, I chatted, I asked if I could take a coupe of pictures..
...and all the while, my other half was browsing the genuine, bit of everything, been here for years Hardware Shop further up the street. That's our kind of trip and I expect we'll be making it again soon. Of course I came home and cast on a sweater. I need to make a dent in my stockpile so I can add more wool to it again. And I knitted and knitted a bit more. And then we went and collected our camper, in the rain. There wasn't much new to be learned there. Rain? We do a lot of it here. But I did spot in the paper something I think it's my duty to pass on. Selfies: There is, they say, some evidence coming to light to suggest that taking selfies with a smartphone can lead to more wrinkles. It ages the skin. Ooh. Today I'm sticking to pictures of wool. How about you? Last week Deb, Ruth, Helena, Eileen, Ladkyis, Susanne, Jane, Mitra, Mary-Lou, Maggie and Alexa made a memo on Monday, with something new, or a first. 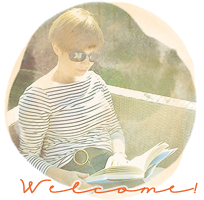 You are very welcome to join us! Give 'em a wave! And have a great week. Lovely colors, indeed. You two will enjoy outings on your own when the time comes - how fun to practice in the meantime. And I am rather liking taking the occasional selfie. Besides I've come to the conclusion that living ages the skin, and I'm just okay with that. Although I do reserve the right to continue buying miracle creams in the off chance it can be undone even a smidgen. Maybe it doesn't lead to the wrinkles .. it just means you notice them more!! your weekend sounds lovely - I remember that excitement about visiting all the craft shops *everywhere* when I first seriously got into scrapbooking about 10 years ago now. Not sure what's replaced that for me ... charity/junk shop rummaging probably. The sight of a poky, independent, goodness-knows-what-I'll-find-in-here Aladdin's cave of old tat sets my heart a flutter in your own woolly way. re: what you'll do without the kids around - it's like when people ask my Dad how he copes with retirement and he tells them he does just fine! 'I had to get up early and go out to work every day since I was 16. Now I'm going get up when I want and enjoy being at home'. Similar situation for you I guess. I think Julie's right about the Selfies---may be one reason why I try to avoid them! 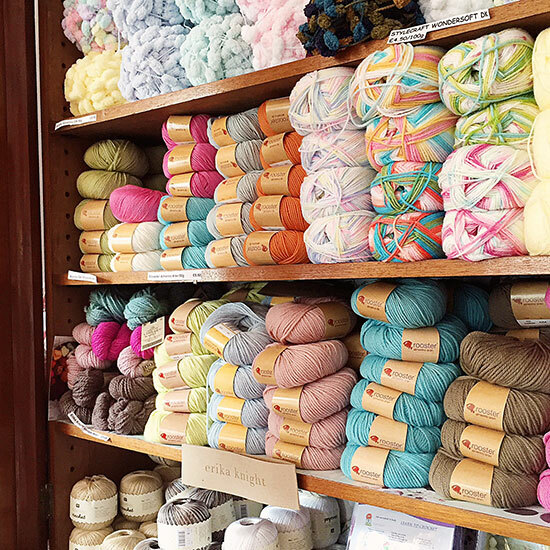 The yarn shop photos are lovely---I'd have a hard time choosing if I were you. Looking forward to seeing what's on your needles now. If our experience is any example, it will take awhile to get used to a quiet house, but you'll have no trouble finding things to keep you busy. We're looking forward to having a noisy house next week with our Chicago family here for a visit. When we went on holiday with our four children everyone had a day to choose what they wanted to do, the low point of the holiday it seemed was always my choice. Now I can go for walks, visit castles and like you browse in gorgeous wool shops, enjoy. 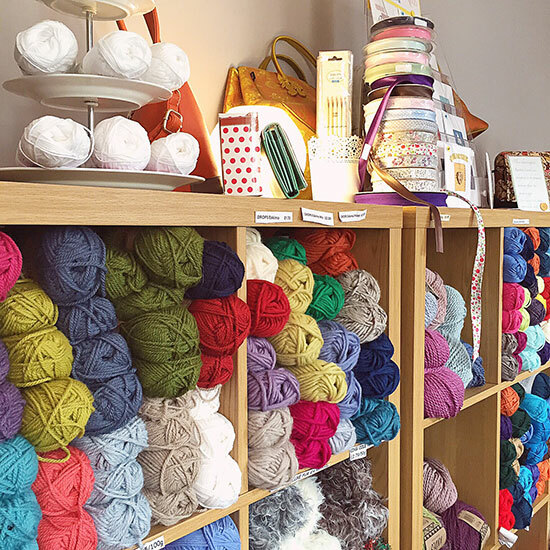 First of all I wondered, is that a photo of inside a shop or the shelves in Sian's craft room ;-) What colours, oh my goodness, keep knitting so you can try some of every range! When I look at our Year 10 students messing about on their phones, taking selfies I do think to myself that in years to come, those pouts and those eyebrows are going to cause some great 'what was I thinking?' moments! Oh those yarns are beautiful - I'm not much of a knitter but that's almost enough to make me what to start something. And I have to laugh at your children wondering what you parents will do without them around. Our daughters say the same thing - I think they can't imagine that we once existed without them! Are you trying to tell us that you are not going to have any empty nest symptoms? Hmmmm well let's just wait and see! My girl has just strolled back in from the final partying. Well she stayed overnight with a friend. I have tentatively suggested that there is a bedroom and office to tidy.... I wouldn't be able to stop myself touching that wool... On the selfie subject my mum has been warning the girls of the latest dangers of selfies but I think she had in mind something a lot more serious than wrinkles! Hope your girl has a good summer. Ha, good job I'm rubbish at selfies, then! 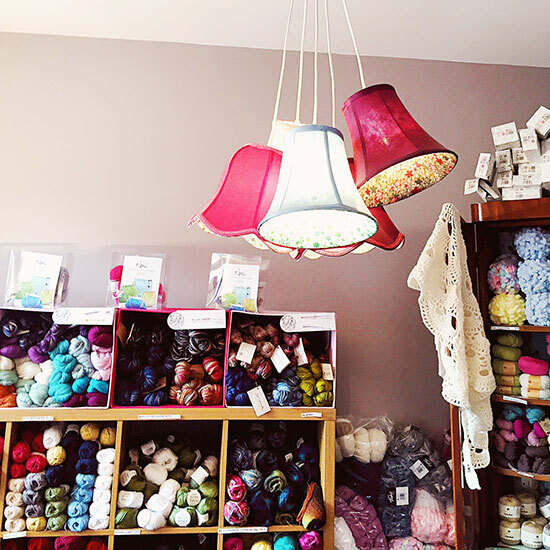 I don't knit, but I'd still love a rummage in that shop. Mind you, I'm quite partial to a hardware store too. I like the reason not to take selfies - those selfie sticks showing up in crowded venues are becoming my least favourite thing. Oh such pretty balls of wool & such, reminds me of ice cream selections. Happy Week. always good to see what you are up to! Sounds like a great weekend. That wool shop looks amazing. It is always so exciting to see all of the colours and textures. That "empty nest" thing takes a bit of getting used to. Supper time with just the two of us seemed the hardest. I do enjoy the quietness and time for just us though. I picked at least three yarns that I really liked....and then decided that you didn't need any extra help in that direction! ;-) Please send some of that rain here. We need some to knock the allergies down, they have been quite horrible! Some day we'll be back to just the two of us, although I am sure there will be a very spoiled dog involved! Very pretty yarn! I asked my dad once why he didn't have a social life (i'm cheeky like that!) and he said my sisters and I were his social life. Lucky for him I have one sister whose reluctant to leave home anyways! All those yummy colors! What an inspiration trip! We've had quite a bit of "just us two" time this last year, and we really enjoy it.